The past couple of years have been long ones in the world of plug-in hybrid executive cars. But now that they’ve survived the awkward years, when all they delivered was a gimmicky tax break to the occasional company boss who probably didn’t need one, these petrol-electric and diesel-electric curios have begun to mature more rapidly than a pubescent teenager after a hormone injection. These electrified hatchbacks, saloons, SUVs and estates are now numerous enough to be spotted on most UK motorway journeys, well known enough to make only slightly geeky dinner party conversation (which my salmon en croute more than makes up for, by the way) and cheap enough to make an appealing alternative to a higher-level conventional petrol or diesel-engined car. All they need to be now is ‘better’: quicker, smoother, more efficient, more refined, more engaging to drive and easier to use than their simpler piston-engined counterparts. And not just in the brochure or the notoriously unrepresentative EU laboratory emissions test, but also out in the real world. Because technology can always be relied upon to win through when it makes a better car. So are we there yet? After the past couple of days, spent in the company of the latest sub-£40k plug-in hybrids from Audi, BMW, Volkswagen and Volvo, we’ll provide an answer to that question over the next few pages. Those two days involved lots of back-to-back urban and motorway mileage, plenty of charging and zero-emissions running, a fair bit of real-world economy testing and some good old-fashioned hard road driving in between. The cars involved – chosen to make as fair a comparison as possible but also to show the choice that already exists in a market to which many remain ignorant – include a five-door hatchback, a four-door saloon and two mid-sized estate cars. The Audi A3 Sportback e-tron brings the lowest CO2 emissions and kerb weight to our proceedings, not so coincidentally also being the smallest car on test. The Volkswagen Passat GTE Estate is the newest and has the most powerful electric motor of the group, as well as the biggest boot. The Volvo V60 D5 Twin Engine bucks emerging mechanical type with its five-cylinder diesel combustion engine and self-contained electric rear axle. 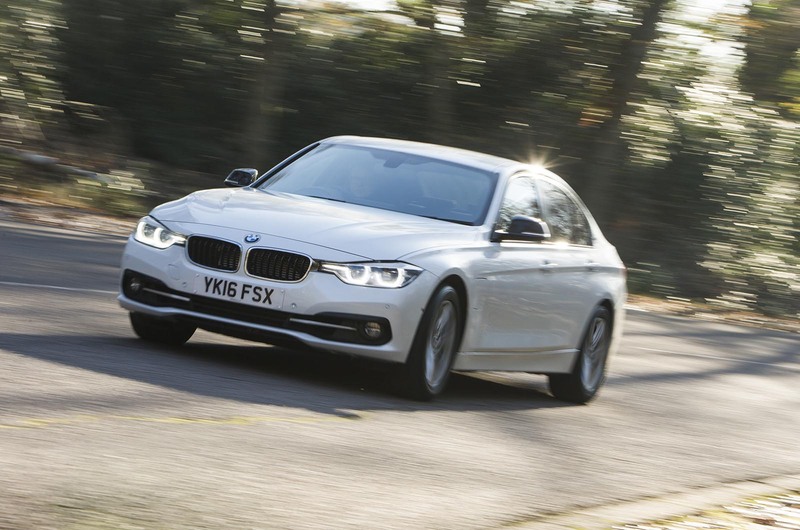 Finally, the BMW 330e keeps things simple, with an electric motor where its torque converter would otherwise be and the smallest drive battery of the four. Here are four cars that are priced between £34,000 and £39,000, are available on like-for-like business contract hire deals for around £400 a month and might save you the thick end of £200 a month on company car tax – depending on what you’re getting out of and how much income tax you pay. So they’re real, they’re affordable and they stand ready to save you a hefty wedge of cash. Which should you buy? You probably already know if you’re the kind of driver who could benefit from a switch to plug-in hybrid power. You’re an Autocar reader, after all – and we’ve been extolling the virtues of PHEVs for long enough now. But in case you don’t, here’s a breakdown. You’ll probably live in an urban area and be within about 30 miles of your place of work. You’ll probably seldom cover more than a few hundred miles in a week. You’ll have a driveway, or at least somewhere to park your PHEV where it can be charged at home; ideally, somewhere at the office, too. And you probably also pay for most of your car’s fuel out of your own pocket. And so, in the spirit of testing new cars in the context for which they were designed, I concocted a short test route to drive our four rivals back to back. The aim was to answer what always seems to be contentious question number one in any conversation you have about these cars: we know the EU test results, and we know they’re bunk, so what kind of fuel economy will these cars really do, and do they really go as far on electric power as it’s claimed? We happened to pick a wintry day on which to answer those questions, and so you can consider the following figures quite conservative. With more than about 5deg C of ambient temperature, the drive batteries in these cars should work a bit better. And yet even the least economical car here will top 80mpg – on that 30-mile town and trunk road test route, admittedly, and only after a full charge. It’s the 330e that props up the order – predictably, given that it has the least capacious high voltage drive battery here and the most powerful combustion engine. Even so, at least to this tester’s 20th century mind, 80.4mpg still seems like a pretty sensational result to get from your 249bhp BMW 3 Series on the way to work. That’s particularly true when you consider that our third and second most economical plug-in hybrids returned little better than the BMW. 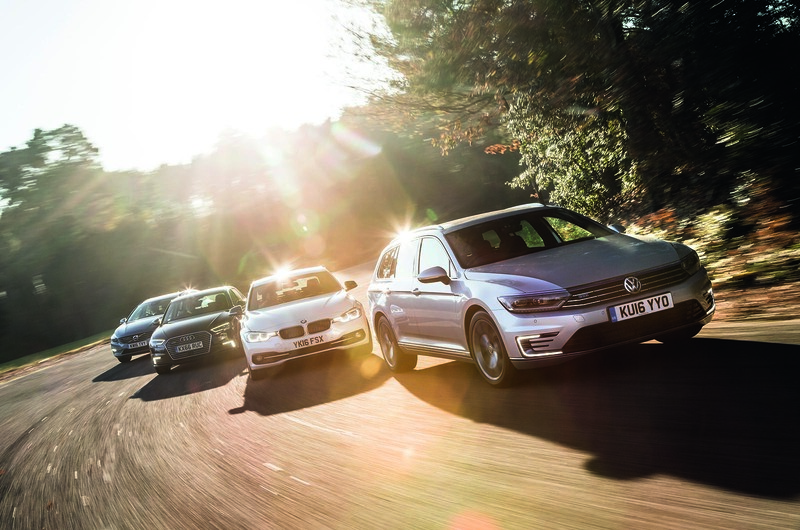 The Passat GTE Estate narrowly pipped the 330e, returning an indicated 81.7mpg – and the A3 e-tron narrowly pipped both, at 86.5mpg. All three cars use fairly compact turbocharged four-cylinder petrol engines, of course, and all use an electric motor that drives through the same gearbox as that petrol engine, so similar economy is to be expected. The Audi’s result proves that a relatively low overall kerb weight can still be an important advantage to a car like this. The Volkswagen’s figure indicates that sophisticated driving controls can also make a difference, because the Passat offers you easier and finer control over the electric motor’s freewheeling and battery regen settings than any of its opponents. But now get this: it’s actually the oldest car in the field, with an ageing five-cylinder diesel engine, that’ll do the most to save you money at the pump. The V60 brings not only the biggest drive battery to this test but also a direct-drive, stand-alone transmission for its electric motor, which outputs to the rear wheels. That means the V60 feels more like a pure EV than anything else on test, responding more instantly to the accelerator pedal around town and running more efficiently at urban speeds, you suspect, than it might if its electric motor drove through a conventional gearbox. 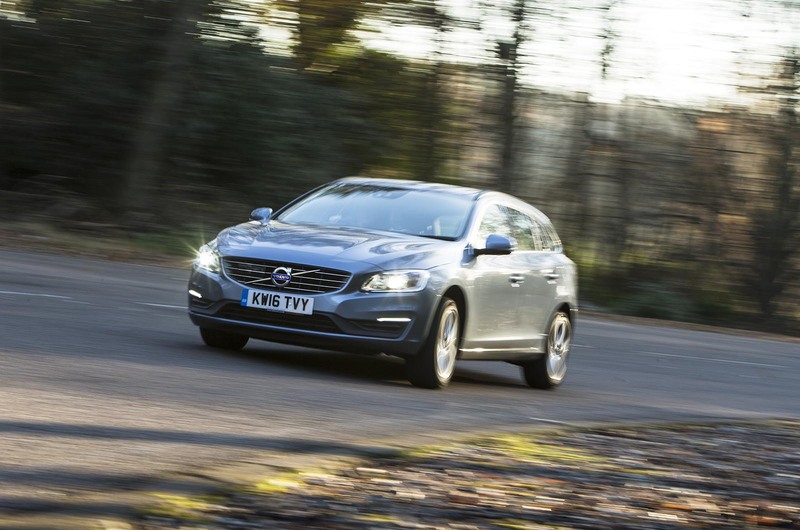 The V60 returned an indicated 153.8mpg on our 30-mile test route, almost doubling the result of the next best car here. Quite a result. 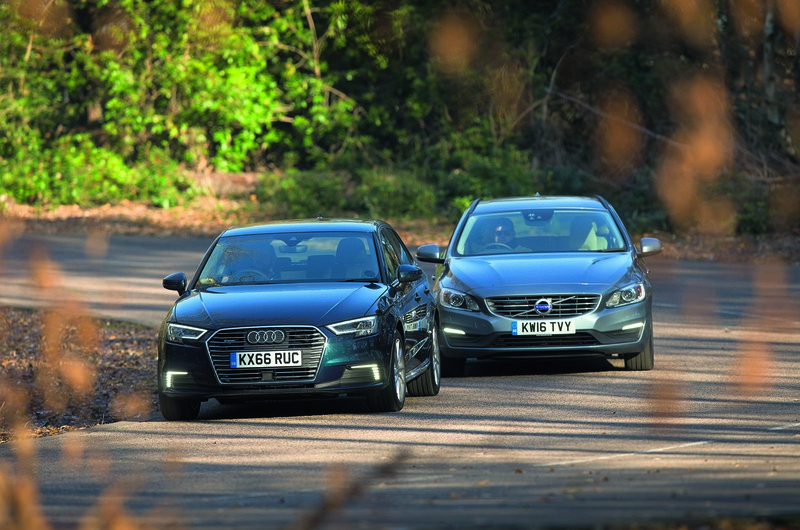 You might expect the same order of merit to be repeated when ranking these cars for zero-emissions cruising range, which we assessed as part of the same 30-mile test – the first 15 miles of which were driven on the urban roads of greater west London. And yet it wasn’t – not quite. The car with the least battery range proved to be the one with the smallest drive battery (7.6kWh): the 330e, which managed 13 miles before the piston engine kicked in. The one with the greatest range also had the biggest drive battery (11.2kWh): the V60, which ran for 23 miles. But the middle order of the Audi and VW, as proven on test economy, was reversed on electric range, the A3 running for 14 miles on battery power alone and the Passat for 17 miles. Before we move on, a quick mention of combustion-engine-only touring fuel economy, which will matter most to those who plump for a PHEV for the tax advantages, won’t bother to charge it frequently and do bigger mileages than our testing has thus far allowed for. If that sounds like you, don’t worry: we expect you’ll be in plentiful company. The Volvo tops this order again, returning 50.1mpg at a 70mph motorway cruise under piston power alone, followed by the Audi (47.9mpg), the BMW (44.6mpg) and the VW (42.2mpg). So even the worst car in the field isn’t far off what a like-for-like economy diesel will return. Apologies if you’ve gone a bit number blind. At least we’ve answered the pressing fuel economy question and proved that, in just about every respect, the V60 Twin Engine puts its electrified powertrain to best use if real-world fuel economy and reduced emissions are your chief priorities. From there, you wouldn’t imagine it possible for the Volvo to emerge with anything other than a resounding win from this test. But this is where we stop reviewing combustion engine electric powertrains with such a narrow frame of reference and start reviewing cars in the round. You can’t ignore how old the V60 feels. If you’re buying a new car – any new car – you don’t want it to feel old, but so much about the Volvo, from the slightly restricted and perched driving position to the infotainment system to the fascia layout, seems that way. In terms of model cycle, the BMW is only a couple of years less lengthy of tooth than the Volvo, but it does a significantly better job of disguising its age, thanks in no small part to that optional 8.8in Professional Media infotainment screen. Both the Audi and VW feel brand new and very smart to travel in. On premium-branded cabin ambience and quality feel, they’re ahead of the BMW and the Volvo. There seems little point in lingering too long on practicality, since our PHEVs occupy precisely the positions you’d expect them to take based on their bodystyles. The Passat GTE Estate is by a distance the most useful car here and the 330e and A3 e-tron contend to avoid the ignominy of being the least. So much, so obvious. What damns the Volvo is the fact that it’s a biggish family wagon that doesn’t quite have big-familywagon-sized back seats or a matching boot, the V60’s electric rear axle eating into boot space a little bit. It’s disappointing but not serious enough in either respect, in this tester’s opinion, to be a deal-breaker for Volvo customers. But what damns the A3 even more tellingly for me is the fact that it’s a compact five-door hatchback that’s priced like the rest of these bigger saloons and estates. 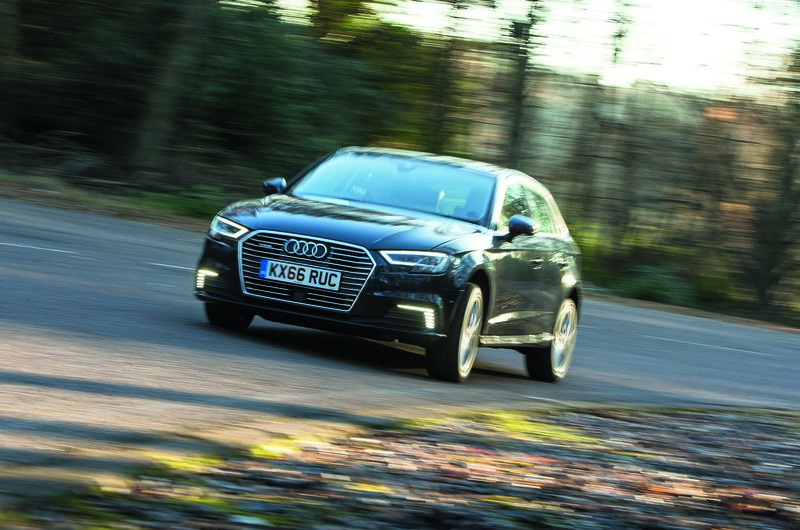 If you aren’t bothered by the relative practicality compromises that the A3 imposes, there’s a good chance you simply won’t settle for a hatchback when your money could run to something bigger. But perhaps that’s just my 20th century mentality at play again. Driving experiences next. We’ve already covered which of these cars does the best impression of a pure EV – and it’s the V60. In town, and even up to about 50mph, the V60’s electric rear axle gives it superbly linear and precise initial accelerator response. 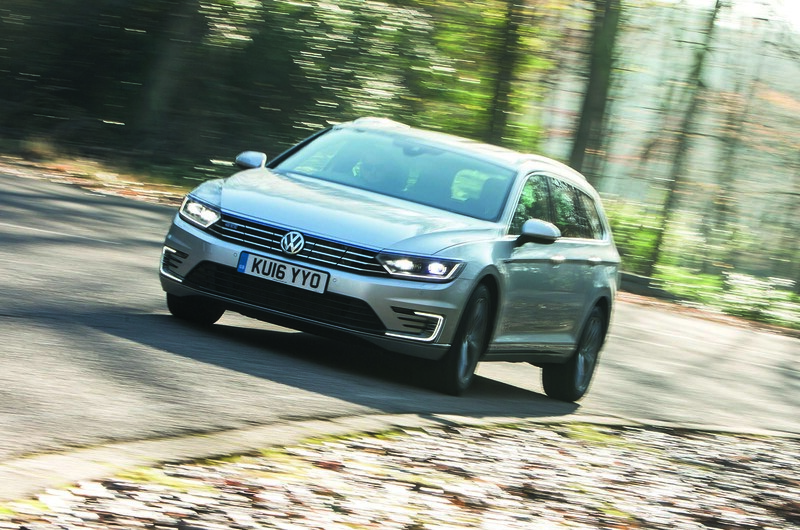 The Passat GTE’s powertrain runs it fairly close, being slightly less responsive and relaxing in EV mode and having the most electric propulsive force to call on. The A3’s hybrid powertrain is a close match for the Passat’s, although it’s not as cleverly instrumented and controlled and it doesn’t have quite as powerful an electric motor. The 330e, meanwhile, suffers from a slightly curious delayed initial throttle response in EV mode, as though its eight-speed gearbox is disengaging every time you come off the pedal in order to decide which ratio might suit its purposes best next. However, when we zoom out to consider performance and handling in a broader sense, the picture suddenly changes. With its five-cylinder diesel engine running, the V60 could not be more different from how it seems under electric power: it’s noisy, rough and antiquated. It has plenty of urge, but it’s plainly a heavy car and feels it at high speeds – at once through its increasingly leaden steering, clunky ride and loose body control. Out of town, then, the Volvo really isn’t so clever. Both the A3 and the Passat ride and handle more competently than the V60. The VW does the better job of the two at combining lowspeed comfort with high-speed composure, with a slight brittleness of ride and an over-assisted steering system taking the edge off the Audi’s dynamic appeal. On outright pace, the Passat and A3 feel every bit as evenly matched as their identical 0-62mph acceleration claims suggest. They’re refined cars, and fairly brisk, flexible and free-revving ones, but neither really leaves a lasting impression on its driver. Which leaves the 330e, which I’d confidently describe as the sweetest 3 Series I’ve driven in years. So far, the BMW hasn’t given much of a sign that it’ll trouble the sharp end of our final order, but forget about the electrified part of the powertrain and drive it like you might any other BMW and the car rewards you like any 3 Series ought to do. Where the V60 feels weighed down, the A3 anodyne and the Passat just a bit plain to drive, the 330e makes its electric motor work just as hard during keen driving as it does anywhere else. 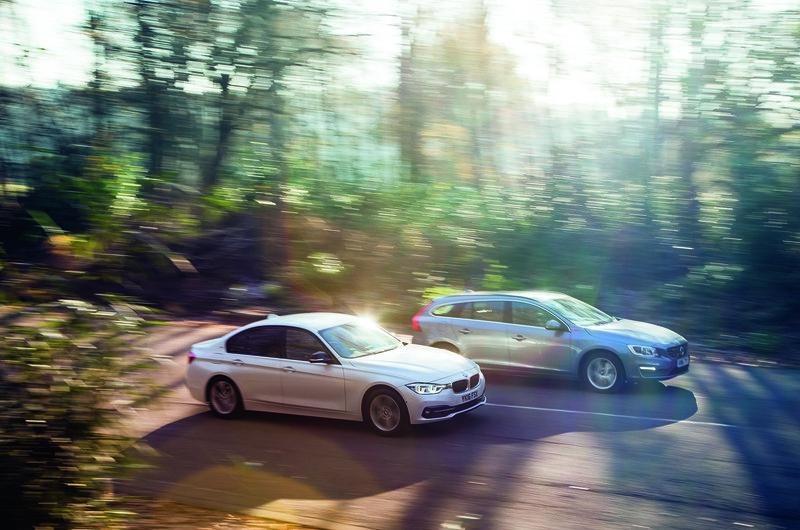 The BMW’s hybrid powertrain retains a smooth, uncontrived, natural delivery even at full power. It’s torquey and super flexible, revs keenly and sounds good – almost like an old 328i that has been future-proofed. The BMW handles with lovely, positive, uncorrupted steering, too, and with perfectly balanced grip levels on its standard 17in wheels, good, close body control and just that distant rumble of run-flat tyre sidewall stiffness that so many BMWs have been afflicted with over the past decade or so. Ultimately, we must conclude that a really compelling driving experience matters as much to PHEV buyers as it does to anyone else. That’s not the only reason the 330e stands out so clearly as our winner: the BMW is also the cheapest car here, possesses easily the strongest performance, has a powertrain that knows very good cruising manners and commendable usability and has proved itself competitive with most of its rivals on real-world economy. 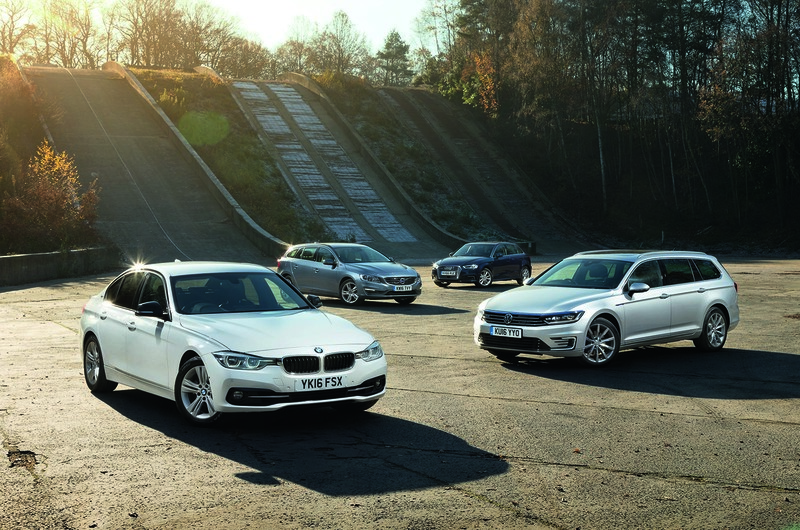 Most convincing of all, the 330e feels like it might genuinely be the best 3 Series on the market, and not just for a particular type of buyer – and it has even stiffer competition for that honour, you’d have to say, than it had for this test win. This is a fantastic review, very fair and comprehensive. I've been delving through some absolute garbage in other publications recently, thanks for re-affirming my faith in automotive journalism Matt. A fairly useful review but i still detected a bit of snide anti-electric tone. PHEV are no longer reviewed as a novelty? It's a good review. I own a 2016 VW Passat GTE Estate, brought not because it was a Hybrid, but because it is a really good estate car. I hope AutoCar start reviewing PHEVs & EVs alongside their conventional counterparts. So ideally you would want the Volvo twin engine design in something that drives as well as the 3 series to have your cake and eat it, so Volvo, pull your finger out, install this electrical power train to a petrol engine in one of your more modern offerings and maybe you will have a winner. Or maybe bmw install a similar electric drive system to Volvo to beat the opposition on all grounds so you can buy with your heart and head. It is interesting to see the petrol engines economy up there with the diesels at motorway speeds, although I know the d5 is getting old. Volvo already do, the 90 series twin engine are petrol/electric hybrids with 400bhp, the 60 series is due of replacement in the next 12-18 months, with a similar engine setup expected, possibly with less power or with a 3 pot petrol/Electric engine, the 40 series is also due for imminent replacement. How did GM blow their lead? Very interesting review. I've only driven the Passat and was very impressed with its refinement. However I owned an Ampera for 3 years which had a 30 mile range in winter and 40 miles in summer. Overall fuel consumption over 35,000 miles was 110mpg. It was very comfortable and well sorted and never missed a beat. It was slightly compromised on space with only four seats and had a Buck Rogers dashboard design. Vauxhall never really marketed it properly and list price was too high. Because of poor sales they decided not to bring over its superior replacement but everyone who owns them raves about them. Shame one of the newer tested cars get near to its performance and economy. I've moved on to a Leaf which is much more impressive than I expected - couldn't go back to ICEs. Agree with the other posters about the objectivity, thoroughness and fairness of this car comparison test. Considering the recent heavily VW-biased new car reviews in the Autocar. Audi and Volkswagen prices are getting ridiculously high possibly in their bid to recover some of the costs of the dirty diesel fiasco. You make it sound as if the cost of electricity is zero. There is an environmental as well as a financial cost for the electricity used to charge electric vehicles. It would be interesting to know the true overall running costs. Fantastic review. Great job guys. Nicely and objectively assessed the pros and cons of the cars' powertrains, real world efficiency and driveability. PHEVs are starting to get there, but still need much faster charging times than is currently the case.